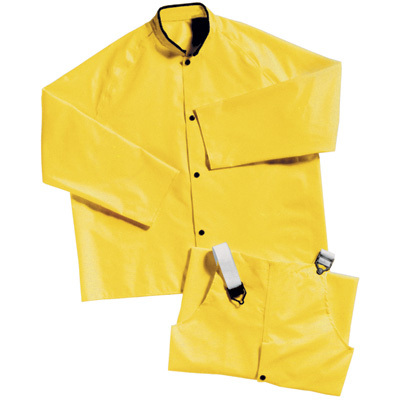 Made of nylon and coated with neoprene, this classic is still one of the strongest rainsuits for working outdoors. The Magnaprene* suit is heavier than the Eagle* and Iron Eagle* and offers excellent abrasion performance and resists oils and chemicals. • A generous cut for freedom of movement with batwing sleeve construction. • Stitched and taped seams are 100% liquid proof. • The neoprene over nylon is 9 oz. material weight and 12 mil thick that's been time proven to be strong and durable in the woods. The material is also flame and mildew resistant. • Jackets feature storm fly front and a corduroy collar for neck comfort. • Bib overalls feature heavy duty suspenders and snaps and plenty of leg room. • Take up snaps on sleeves and ankle cuff for an adjustable fit.